Harvest time may be less than a month away for many Georgia peanut farmers, but University of Georgia Cooperative Extension plant pathologist Bob Kemerait insists there is still time to treat the crop for white mold disease. Kemerait said peanut prices may not be what farmers hoped for, and they might feel forced to settle for cheaper treatments that result in less effective control of the white mold fungus. More effective treatments are called for with white mold disease this year. The most effective products may cost more, but their true value is seen at harvest, according to Kemerait. “This year we really need to be aggressive, even at this time of the season,” Kemerait said. "Very warm temperatures this season have fueled white mold; dry conditions have driven it underground. It is only now that many growers are becoming aware of how serious the problem is in their fields." White mold is often the No. 1 cause of the loss of peanuts due to disease in a season, according to Kemerait. Sclerotium rolfsii, the causal agent of white mold, is a fungus that remains in the soil between cropping systems. It waits for the next susceptible crop to be planted. White mold becomes more of a problem when growers fail to use proper crop rotations. 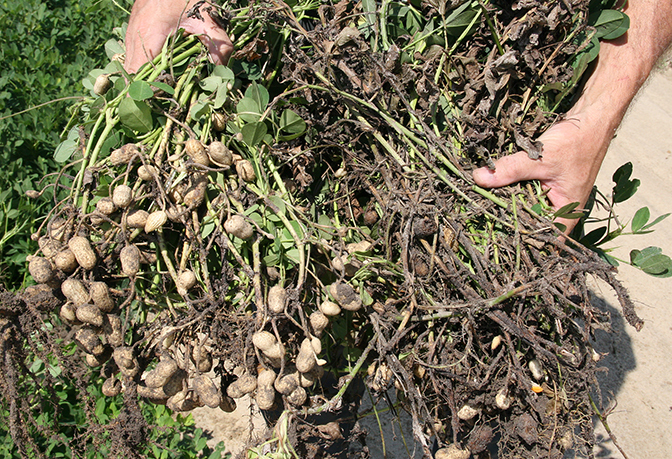 Growing peanuts behind peanuts is highly discouraged because of diseases like white mold. Unfortunately, some Georgia farmers have used this practice this year, which invites attacks from the white mold fungus living along the soil line, near the surface. Because of its ability to move underground, it is extremely hard to manage with fungicides. “White mold has been really bad this year for a couple of reasons: I think we’re on a shorter rotation because we’ve got big peanut acreage behind big peanut acreage. The second thing is [that] conditions are favorable; very hot weather fuels the disease, as does very dry weather. When you have a double-edged sword — hot and dry weather — what happens is that the heat fuels the white mold and the dryness pushes it underground. It then gets harder to hit with a fungicide,” Kemerait said. If the fungicide fails to contain the disease, the peanut plants are vulnerable, especially the limbs, crowns and pegs, which can be completely destroyed. Chemical applications are also reliant on water to move the treatments down to the limbs of the plants, which are often shielded by dense foliage, where the disease is located. This has been a huge problem for dryland farmers this year because of the inadequate rainfall Georgia has received this summer. “Where we’re seeing the biggest problem is with dryland growers in what have been, for many, a drought-filled year. If the disease is underground, the farmers don’t have any rainfall to move the fungicide down, so it’s a big problem,” Kemerait said. Farmers can choose to apply treatments at night. Nighttime spraying has become a more viable option thanks to Global Positioning System, or GPS, technology. GPS keeps the tractor on the row in case visibility is hindered because of darkness. “If the peanuts are sprayed at night, leaves are folded up and you have much more of a direct path to the interior of the plant, where you need protection from white mold,” Kemerait said. Spraying during the day makes it more difficult for the treatment to actually reach the crown and limbs of the plant because of interference from the leaves. Nighttime fungicide applications were developed by UGA Extension plant pathologist Tim Brenneman based on his observations of farming practices in Nicaragua. For more information about white mold, see https://youtu.be/4W5NrLsp8i0.